The is the book that has been ‘in progress’ for fifteen years. I bought a copy, back in the days when I lived and worked in London, I started reading then and I’ve picked it up and read bits at various times over the years since, but I didn’t read it from cover to cover until this year, when I realised first that it would be useful for my century of books, and second that I wanted it read and out of my life. Because when I bought this book I was a commuter, like the 253 that give this book its title, but ten years ago I gave it up to come back to Cornwall. And because last year Poems From The Underground reminded me of the romance of travelling in London, and this year 253 knocked out all of that romance and reminded me of the grim reality. It’s not that it’s a bad book; indeed it might well be a very good book but, for me, its time has come and gone. A train on the Bakerloo line can seat 252 passengers, and so, if there is nobody standing, the driver makes 253. 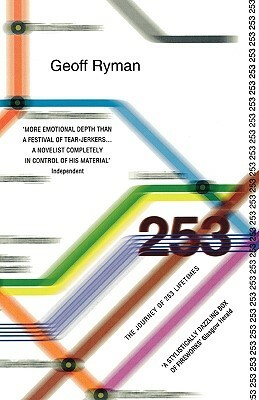 This is the story of those 253 souls, at one particular moment on one particular day. Or rather it is 253 stories, each told in 253 words that explain how they appear, who they are, and what they are thinking. It was a remarkable feat, to create 253 different stories, to show so many different aspects of life, and to show how many different threads linked different passengers, sitting in different seats. A woman with a pageboy haircut and wearing a green poncho is thinking through an article for the in-house magazine she edits. A grubby middle-aged man, travelled on the underground all day to keep warm, and to beg for money. A middle-aged woman is travelling home from the cleaning job she took to try to make ends meet when her husband lost his job, hoping she won’t meet anyone she knows. And so it goes on – people watching on a grand scale. It’s wonderfully clever, but it’s also very bleak, and it didn’t match my memories. I remember middle-aged men, who plucked their phones from their pockets a few stations from home to announce their arrival, I remember bright, excited, fashionable young women. I remember readers who were clearly absorbed in their book or their newspaper, but I couldn’t find any of them among the 253. Of course I was often wrapped up in my own book, and I was on another line in another part of London. Maybe people were happier on the Jubilee line, or maybe I just didn’t look around enough …. but I do believe that there were more people on the Bakerloo line who were happy, or at least accepting of the hand that life dealt them …. I’m glad I finished the journey, and I’m more that glad that it’s over. Should you wish to observe this particular train, at this particular time, it began its journey online and it’s still here …. This is my favourite novel of all time. I love it. It could not be better. I’m always surprised when I hear otherwise about it – I think I’m a little over sensitive about it :). Glad you got round to finishing :)! I think I might have loved it more if I’d read it when it was published and when I was still in London – it’s very much a book of its time and place. I’ve never lived in London and think I read it about 8 years after publication. I think I’m just a bit too obsessed with people-watching not to enjoy it :). Yes -Lady Rose and Mrs Memmary! I was disappointed by this book too. I really loved Geoff Ryman’s Air, or Have Not Have, though. I’ve not ever spotted his other books. I’m not going to rush out and look for them, but I’d certainly look at them if I spotted them, because even though I didn’t like this as much as I hope it was a wonderful idea. It was ages ago when I read this book, and I can only remember the denouement. Obviously it was terribly clever, but maybe too clever for its own good? Yes, a little too clever, and I don’t think it’s aged well.